30 spool acrylic box for easy thread storage. Perfect for storing your Isacord or any other 1000 meter or 1100 yard thread cones. Keep your sewing and embroidery thread organized by project, color, or usage! Convenient and writable area on box lid to label contents. 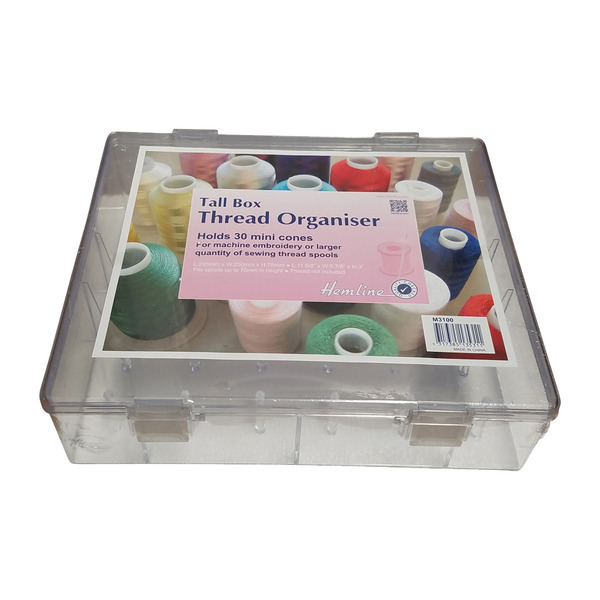 This attractive box will hold 30 colors from your Isacord, Poly-X40 or Robison Anton (or size equivalent) thread collection. Each spool rests safely on a spindle and the colors can be seen through the clear box. The boxes are made of high impact plastic and are stackable. Compatible and stackable with other Isacord thread cases. Includes 1 case of 6 clear stackable boxes. Dimensions: 11.5" x 9.75" x 3"
Very happy with my purchase, good price and shipping. I love these storage boxes! I bought a set previously, but I needed another set to be better organized with all of my thread colors. These boxes are perfect for mini king cones of embroidery thread. Highly recommend them!